In 1997, 500 taiko players gathered at the Japanese American Cultural & Community Center (JACCC) in Los Angeles for the first North American Taiko Gathering (NATC). It was the first large-scale gathering of its kind, building upon a number of movements happening within the taiko community. It took many years for the first NATC to become reality. Roy Hirabayashi of San Jose Taiko and former chair of the NATC Advisory Board, notes that the roots of NATC could be traced back to the late 1980s, when American group leaders talked with staff members of the Japanese group Kodo about ways to create an American taiko community while also fostering relationships between Japanese and American groups. In 1995, the first Intercollegiate Taiko Invitational, an annual gathering of collegiate groups on the West Coast, was held at Stanford University. However, it was not until Jerry Yoshitomi and Duane Ebata of the JACCC began speaking with taiko group leaders in the late 1990s that the idea of a national taiko conference truly gained momentum. When the first NATC happened in 1997, people from across the continent came together for the first time to learn about, perform, and celebrate their love of taiko. This was a seminal moment in the history of taiko in North America. According to conference coordinator Kevin Higa of Kinnara Taiko, there had never been ongoing conversations between groups regionally, let alone on an national level. Indeed, the idea of NATC was met with cautiousness – even as they wanted the conference to happen, many were careful to embrace the idea wholeheartedly. 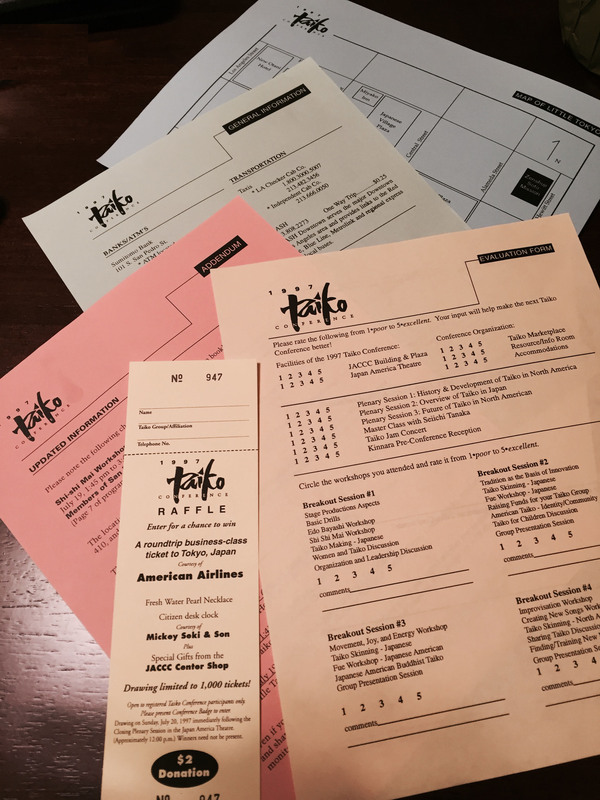 Registration packet from 1997, complete with evaluation forms, raffle ticket, and venue map. Despite these initial concerns, Johnny Mori of Kinnara Taiko and Alan Okada of Soh Daiko – members of the advisory committee for that first conference – reflect that the conference became a way for people to get together, reestablishing old relationships while also creating new ones. The NATC brought together people not just from different parts of the continent, but also with different approaches to taiko. There were groups with different organizational structures, different playing styles, and even different thoughts on what constituted taiko performance. That they overcame those barriers was, in the minds of the organizers, one of the major triumphs of the conference. NATC continues to celebrate the differences amongst players and the diversity of taiko in North America. It brought people together and provided a forum to express their views and learn from one another, laying the foundation for what Roy Hirabayashi later described as a network for taiko players to share information about their art. The format of the 1997 NATC set the tone for all conferences that have followed, featuring workshops, discussion panels, and concerts. The first Taiko Jam concert featured performers from across North America: the Kenny Endo Taiko Ensemble, Seattle Kokon Taiko, Soh Daiko, Hinode Taiko, Zenshuji Zendeko, and the San Francisco Taiko Dojo. Alan Okada, who played in that concert with Soh Daiko, remembers the feeling of playing in front of their teachers, friends, and the rest of the taiko community, the stress that preceded the concert and the feelings of relief, elation, and joy once the concert was over. By the end of the weekend, the conference was recognized to be as a total success. Kevin Higa still remembers the overwhelming positive energy brought by all participants, a sentiment he still feels at every conference. Even though it was originally conceived as a one-time event, no one wanted to see the energy and momentum end. NATC 1997 ended with an announcement from Duane Ebata encouraging groups to host their own regional gatherings the following year, and inviting everyone back to LA Japantown for NATC 1999. 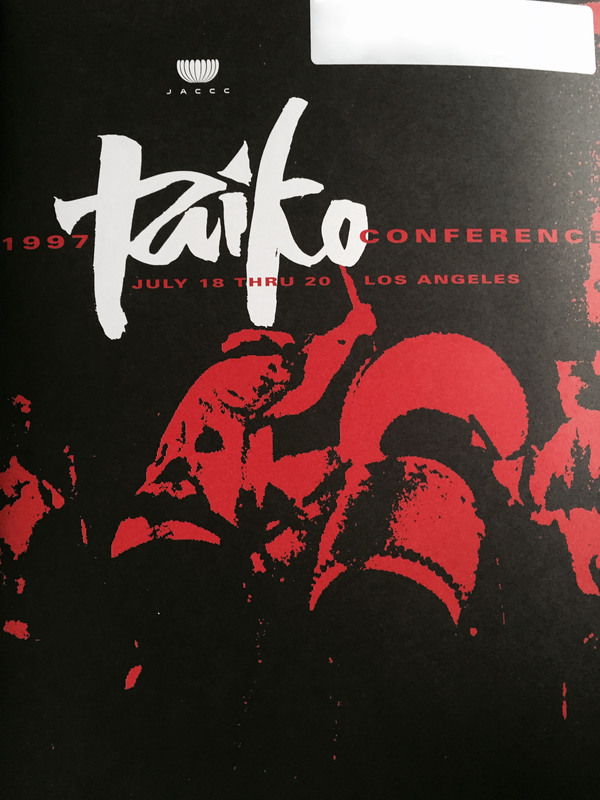 Not only did the 1997 NATC inspire smaller gatherings, like the Regional Taiko Gathering in the Pacific Northwest, and later the East Coast Taiko Conference, but it also laid the groundwork for future North American Taiko Conferences, which now 20 years later continue to bring the taiko community together. People from around the world come to celebrate their common love of taiko. And, just as the organizers hoped, the conference helped foster the idea of a greater taiko community. Since 1997, there has been a committed group of taiko players that have met and gathered nine times, with the tenth coming up in August 2017. As we celebrate the diversity of our community, we come together to honor the efforts of those who have come before us and pave the way for the future of taiko in North America. Throughout the month of April, we will be adding to the #20YearstoNATC Timeline by bringing you perspectives of NATC’s significance from various factions of the taiko community. Don’t miss out on NATC 17! Written by: Ben Pachter, TCA Program Committee. Edited by: Elise Fujimoto, TCA Communications Committee. Special Thanks: Kevin Higa, Johnny Mori, Alan Okada, and Roy Hirabayashi. They put together the first conference, and are still working to make NATC happen today.